Stephanie Gilmore claimed a historic seventh World Title at Honolua Bay in Hawaii. Gilmore’s incredible achievement comes following remaining challenger Lakey Peterson’s early elimination from the Beachwaver Maui Pro, the final stop on the 2018 Women’s Championship Tour. 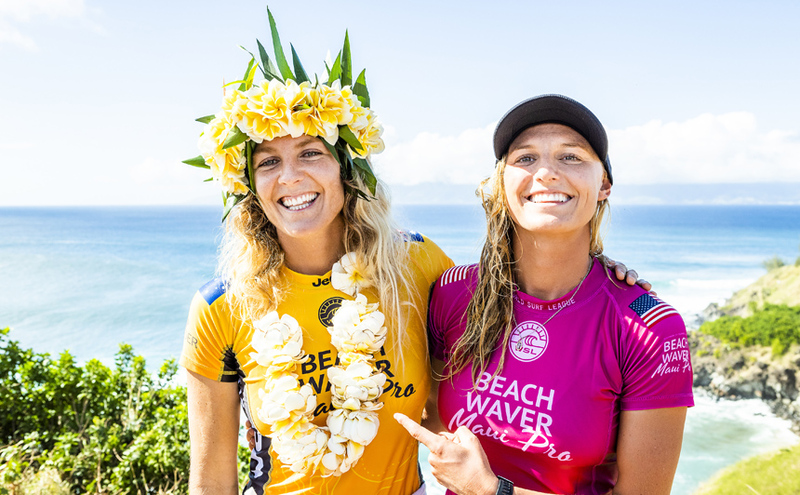 Freshly minted 7X World Champion Stephanie Gilmore (AUS) and World Title runner-up Lakey Peterson (USA), despite the win and loss celebrate the years success with each other at the 2018 Beachwaver Maui Pro at Honolua Bay, Maui, Hawaii, USA. Stephanie Gilmore of Australia won Heat 3 of Round 1 at the Beachwaver Maui Pro, Honolua Bay, 2018. Lakey Peterson (USA) is eliminated from the 2018 Beachwaver Maui Pro with an equal 13th finish after placing second in Heat 3 of Round 2 at Honolua Bay, Maui, Hawaii, USA. The heat loss ended Petersons hopes for a maiden World Title and sees her finish runner-up in the Jeep Leader Rankings. Gilmore is also the 4X defending event winner in Maui and will look to top off her incredible season with one final victory in Honolua Bay. The newly crowned World Champion sailed through her Round 1 and 3 heats with her impeccable form. Peterson’s world title hopes were dismantled after she was eliminated from the event in Round 2 at the hands of replacement surfer Alana Blanchard (HAW). Despite the early exit, 2018 marks Peterson’s best CT finish to date, who will finish up the year as runner-up. The Beachwaver Maui Pro will be broadcast LIVE on Facebook.com/WSLand WorldSurfLeague.com. Also check local listings for coverage from the WSL’s broadcast partners. Stephanie Gilmore of Australia won the World Title during Heat 3 of Round 2 at the Beachwaver Maui Pro, Honolua Bay, 2018.